Tiny Toes in SoCal Sand: Butterflies!! I currently have 17 caterpillars in my family room. This grosses me out completely. But this is what we as mothers must do in the name of home education. 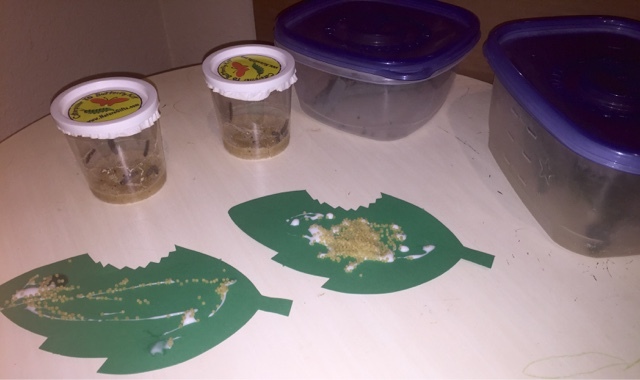 In anticipation of this month's theme, "Bees and Butterflies" from Mother Goose Time (MGT), I ordered caterpillars online. It's apparently going to take around three weeks for the caterpillars to turn into butterflies and then they'll love for two to four weeks after that. When I told Tiny B what we were going to do, and I asked her if she was up to taking care of butterflies, she got insanely excited. I know that bringing the lessons to life with real experiences is a must, and she is possibly the most eager student, ever. I took Strong B on his first train ride, and the entire time he couldn't stop talking and thinking about the beautiful (horrendously ugly) caterpillars we had seen at the train station, so this is how I ended up with seven more caterpillars in addiction to our ten original "cute" ones. We read about how to care for them and we are ready! I started on lesson 11 this month because 11-20 is about butterflies. The first ten lessons are about bees and I plan to go and do those after we do our butterfly lessons. The month looks adorable...As I unpacked the daily bags I saw lots of cute games and projects. I have a feeling we will still be working on this theme into April! Day eleven's lessons was about eggs. 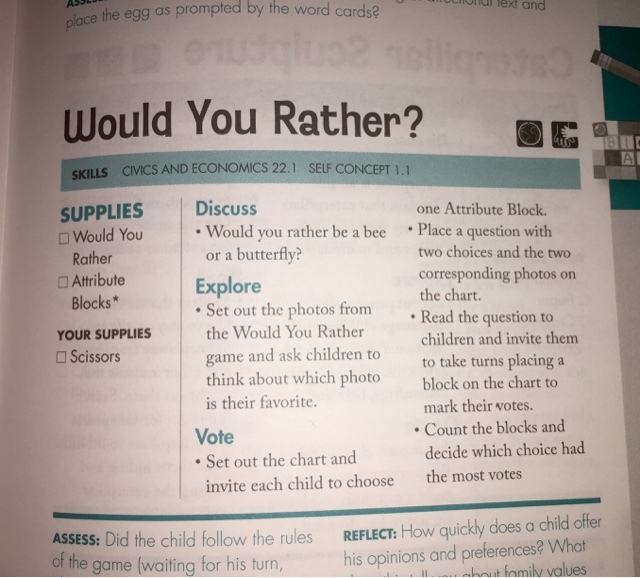 We started with a game of "Would You Rather?" 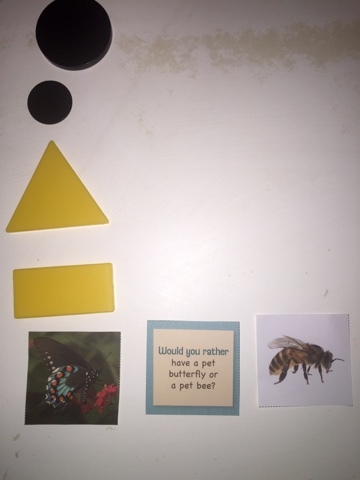 in which we answered survey-type questions about bees and butterflies and used attribute blocks (the yellow and black blocks) to show our answers. To extend the lesson, I asked them to count how many answers were in each column. We watched a YouTube video about the life cycle of butterflies. 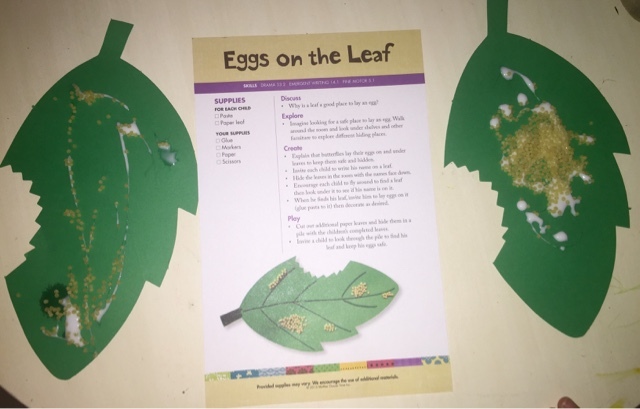 I then hid their leaves in the room with their name on it and had them fly like butterflies to their leaf and lay their eggs (attach tiny pasta to the leaves with glue). Next, we talked about how stories have a beginning, middle, and an end, and they came up with their own egg stories. It was the first time that I've ever had them dictate stories to me. 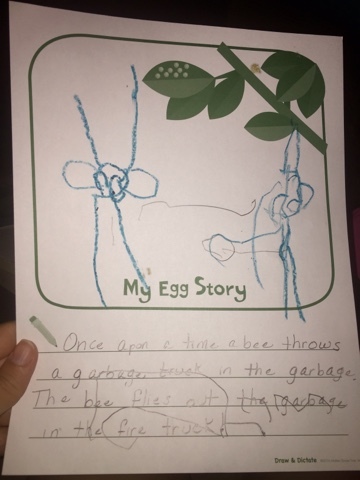 Strong B created a hilarious story about a trash can, fire truck, and bees. 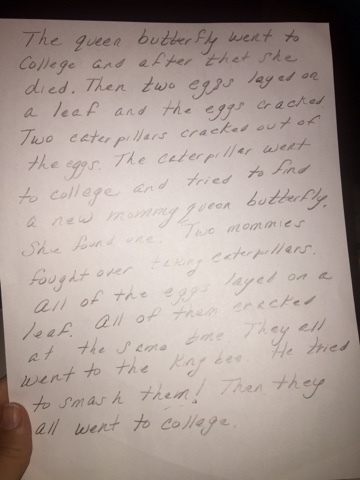 Tiny B dictated a story about a queen butterfly and death and college. She wanted to continue with her story forever and it was amazing, but I was hungry so we had to stop after we used the entire back of the page. 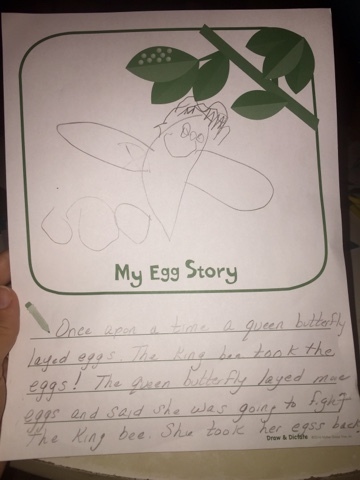 I definitely can see that she is going to have a talent for coming up with imaginative stories and I'm going to need to need to continue to help her develop this amazing skill. 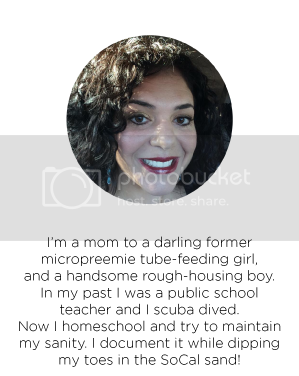 I love homeschooling because I can truly work with each of them to develop their talents. She did what so many kids do which is have a beginning, middle, and an end, but then after the end she continued going on and on and on...I guess the apple doesn't fall far from the tree! Ha! I didn't stop her because she's only in preschool and I'd rather her develop this imagination than get an exact beginning, middle, and end. That will come later. I did one mini-lesson from tomorrow's lesson on caterpillars. We read the recipe card together and made caterpillars. 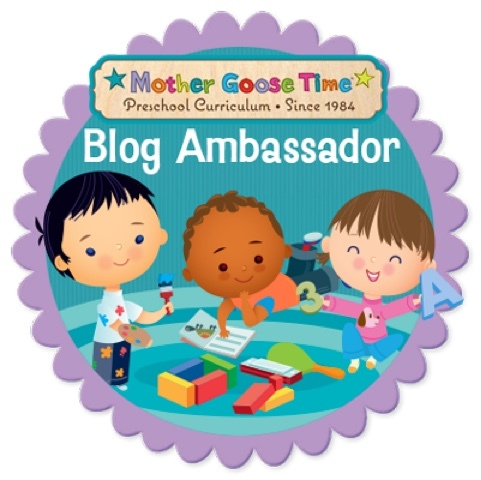 It's going to be such an exciting month with these butterflies! Perhaps they'll grow on me and I won't be so grossed out...We'll see! At least I won't be bringing bees into my family room. We've done the caterpillars a few times and the girls always love having them. After we release the butterflies they usually stay around the yard for a few hours and will even sit on the kids hands and clothes.